Established in 1960, the Buffalo Bills are the only NFL team that plays its home games in the state of New York. The Bills are also a team of many firsts – they are the first team to win four consecutive conference championships from 1990 till 1993. However the Bills are also the only team to have lost four consecutive Super Bowl games during the same period. Since 1999 and up until 2017, the Bills had not made it to the playoffs, making them the only NFL team not to have appeared in the playoffs in the 21st century. But the Bills finally ended the streak by making the playoffs in the 2017 post season. The Bills will be looking to return to the postseason this year again and make a run in the playoffs. After several disappointing seasons, the Bills are ready to strike and take the AFC East division title. With a newly revamped team on both sides of the ball, the Bills are set up quite nicely for future success. Buffalo will have to edge out rivals the New York Jets and the New England Patriots to claim the division crown. Grab your Buffalo Bills tickets and get over to Ralph Wilson Stadium to be a part of Bills history. The Buffalo Bills may have had it rough lately, however from 1990-1993, they were virtually unstoppable in their conference. 1990 Season – In a lot of ways, the Bills 1990 season was a repeat of their last two seasons, in which the team had finished first in their division. The 1990 season, however, was a little special. Unlike the 1988 and 1989 seasons, when the team lost early in the post-season games, the Bills went all the way to Super Bowl XXV. The game was played on January 27, 1991, at the Tampa Stadium in front of 73,813 fans. It was the closest the Bills ever came to holding the Vince Lombardi trophy. They lost to the New York Giants 20-19. 1991 Season – The Bills once again won their division, the divisional playoffs and conference championship and once again made it to the Super Bowl. Super Bowl XXVI was played on January 26, 1992, at the Hubert H. Humphrey Metrodome, Minneapolis, with 63,130 fans in attendance. On this occasion, the Bills lost to the Washington Redskins 37-24. 1992 Season – This season was little different from the team’s previous seasons, since they came second in their division and made it to playoffs as a wild card. Nevertheless, the Bills once again saw themselves playing in the Super Bowl. Super Bowl XXVI was played on January 31, 1993, at the Rose Bowl, Pasadena, California with a massive crowd of 98,374. The Bills were facing a formidable opponent in the shape of the Dallas Cowboys. The Cowboys trounced the Bills 52-17. 1993 Season – In 1993, the Bills clinched their division and made it into the playoffs yet again, their sixth consecutive appearance. Consequently, they reached the Super Bowl once again, their fourth consecutive appearance. However, they lost to the Dallas Cowboys the second time 30-13. This turned out to be the Bills’ last Super Bowl appearance at the Georgia Dome in Atlanta Georgia in front of 72,817 spectators. The Buffalo Bills rivals can be divided into two categories – their AFC East rivals and the rest of the league. Even though the Dallas Cowboys do not play in the AFC East, there is still bad blood between the two teams. The Dallas Cowboys – As mentioned earlier, the Bills lost two consecutive Super Bowls to the Cowboys. This began a rivalry between the two teams, which didn’t last long. Since 1993, the two teams have not met in the playoffs and their brief rivalry is in a till we meet again mode. The Miami Dolphins – The Dolphins are perhaps the biggest rivals of the Buffalo Bills. The rivalry began when the Dolphins won every game against the Bills in the 1970s, making an NFL record for 20 straight games against a single team. Fortunes changed however in the 1980s with the arrival of Jim Kelly as the Bills QB. Kelly and Dolphins QB, Dan Marino, had a rivalry of their own. The Bills however dominated the Dolphins in the 1990s. The New England Patriots – With the rise of Bill Belichick’s and Tom Brady’s New England Patriots, the team has replaced the Dolphins as the Bills fiercest rival. Both teams play in the AFC East and after Belichick’s taking over of the Patriots, this rivalry has become lopsided. As of 2016, the Patriots lead the series with an all time head to head score of 70-43-1. The Buffalo Bills have a storied history. Nine members of the team have been inducted into the Pro Football Hall of Fame. Bruce Smith – Smith was one of the best defensive players in the NFL. He recorded more sacks than any player in the League. In his 15 seasons with the Bills, he recorded 171 sacks and 941 tackles. Jim Kelly – Kelly took the Bills to the Super Bowl four years consecutively. He was a five-time pro Bowler and three times All-Pro. O.J. Simpson – Simpson was one of the best running backs in the NFL. He was also a five-time All-Pro and was named to six Pro Bowls. As mentioned earlier, the Buffalo Bills play their home games at the New Era Field, which was formerly named Ralph Wilson Stadium. Their open air 72,000 seat stadium is located in Orchard Park, New York. The Bills constructed a Wall of Fame that bears 29 Bills' legends. Ralph Wilson Stadium will now feature local vendors to provide fans with true Buffalo foods and with an expanded perimeter fans can enjoy more comfortable and spacious seating accommodations. Keep an eye on the Buffalo Bills tickets 2018 as the latest NFL schedule is out. The 2018 campaign includes home and away games, pitting the Bills against their arch rivals, especially their divisional rivals, the New England Patriots. Could the 2018-19 NFL season be what the team has been waiting for? Grab your tickets to find out! Our process for purchasing cheap Buffalo Bills tickets is simple and fast. There are so many online ticketing sites, that it can be hard for customers to find the right place to buy Buffalo Bills tickets at the cheapest price. At ScoreBig we think of our customers first and foremost. We offer daily deals for Buffalo Bills events, so our customers can get the best seats for the best prices. ScoreBig will always go above and beyond to offer the cheapest Buffalo Bills tickets on the market. The Buffalo Bills schedule above, displays all available events for 2019 and 2020. Once you find the event that you would like to go to, click the red “Get Tickets” button. It is located on the right-hand side of the event listing, it will take you to an Buffalo Bills event ticket page. ScoreBig's event ticket page will display all available Buffalo Bills tickets for that event. On the event ticket page to help with your search for the right Buffalo Bills tickets, use the filters at the top to select quantity, price range, and more. There is also an interactive seating chart so you can pick where you want to sit. When you are ready to buy a ticket, click on the listing, and you will be directed to ScoreBig's checkout page. Upon completion of the information fields, your order will be processed and your Buffalo Bills tickets will be delivered via email, mail, or to your mobile device. What makes ScoreBig’s site stand out from the rest? We are constantly analyzing our competitors to improve our site, service, and prices. ScoreBig.com employees strive to offer the best process and experience to buy cheap Buffalo Bills tickets. Our goal is to get you the best seats to Buffalo Bills events. We offer daily discounts on our site and for special promotions check out our newsletter. If there are no Buffalo Bills events currently available, you can use our search feature at the top of the page to see a list of all popular events going on near you. No matter your price point, we have all the best deals and discounts on Buffalo Bills tickets. For more information on prices of Buffalo Bills tickets and the schedule for Buffalo Bills, check out our listings above. The last thing you want to find out is when the Buffalo Bills event you wanted to go to is sold-out. Don’t worry in many cases ScoreBig has affordable tickets to sold out events. We sell tickets from GA all the way to premium seating and parking. Skip the scalpers in the parking lot and get your tickets online from top Buffalo Bills ticket brokers. We get you in all events, buy your Buffalo Bills tickets here from a brand that many trust and rely on for all their ticketing needs. ScoreBig offers a 100% money-back guarantee. If you have been in search of cheap tickets for Buffalo Bills, ScoreBig by far is the best option. That’s why ScoreBig has more loyal customers than any other ticketing site. 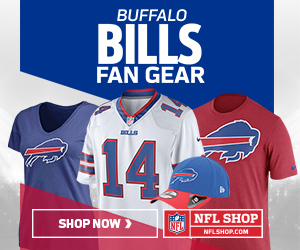 Shop at ScoreBig for safe and secure Buffalo Bills event tickets.